April 7, 2017, 10:16 PM · SALOU, Tarragona, Spain — PortAventura World in Spain today opened to the public its new expansion, Ferrari Land. Reportedly costing €100 million, it's the largest single expansion in the resort's history - so much so, it's been opened as a second gate and requiring a separate ticket. In keeping with the standard over the road at the main park, Ferrari Land is beautifully landscaped. Much like Place de Remy at Disneyland Paris, the area itself is perhaps more of a draw than the attractions it contains. It's a gorgeous reproduction of a Renaissance Italian town, complete with ornate piazzas and a bell tower. Somehow, the behemothic Ferrari Experience - an imposing mass of red and black curves more resembling a spaceship - even manages to fit in quite elegantly in the centre of it all. Red Force, the park's signature ride - now the tallest and fastest roller coaster in Europe - is precisely what you expect from a Vertical Accelerator. It's tall, fast and loud, reaching a height of 112 metres and a speed of 110mph. In a nice touch, a grandstand has been built alongside the track, building the sense of spectacle for both riders and audience. Note from Robert: I would be remiss not to include here today's top viral GIF, a Fabio moment for one Red Force rider. There is so much wonderful awkwardness in this video. I especially love the aborted high five from the other rider. In the aforementioned Ferrari Experience building are two simulator attractions - Flying Dreams and Racing Legends - and a brief exhibition showcasing Ferrari history. Both rides here share the same entrance and preface, an opening spiel from the ghost of Enzo Ferrari using the Pepper's Ghost technology we've seen in the pre-shows for Escape from Gringotts at Universal Studios and Derren Brown's Ghost Train at Thorpe Park. Flying Dreams copies the basic Soarin' template, but has us following Ferrari cars through those locations. It's not really anything we haven't seen before, but done well enough to elicit delight from anyone new to the technology. Less effective is Racing Legends next door, an omnimax simulator that puts us in 8-seater vehicles fashioned like F1 cars to 'test out' famous tracks through the ages. It's not immersive enough to shake the feeling that we're just jiggling around in front of a cinema screen. Nor, I suspect, realistic enough to even have much niche appeal to Ferrari fans. The attraction line-up outside is filled out by a few simple extras. Maranello Grand Race is a cute Autopia-style cruise around the land, although (typically for this ride type) suffers from a low throughput. The two Thrill Towers are simple drop towers that supposedly offer different kinds of drop patterns, although only one side was operating for most of the day I visited. There are two smaller attractions for very young children tucked away at the side of the land - a spinner and a play area - and Pole Position Challenge, an up-charge attraction (€25) that offers the chance to test out the kind of personal simulators racing drivers practise on. Throughout the day, street entertainment keeps the park's alive with traditional Italian fanfares, flags and acrobatics. A dance & acrobatics show isn't quite to the same standard, but high energy enough to get away with it. 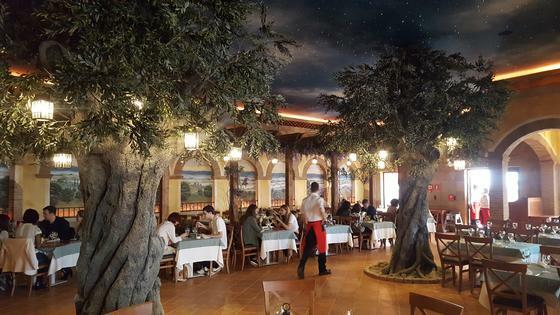 Food in the park is mostly typical counter service options, with one upmarket choice in table service restaurant Trattoria Cavallino. It's a very typical trattoria concept, but featuring simple, elegant design that lets the location do most of the work. The staff were having some first day woes, but were welcoming and helpful throughout. The highlight however was the meat dishes. The beef strips were tender even at medium, seasoned beautifully. 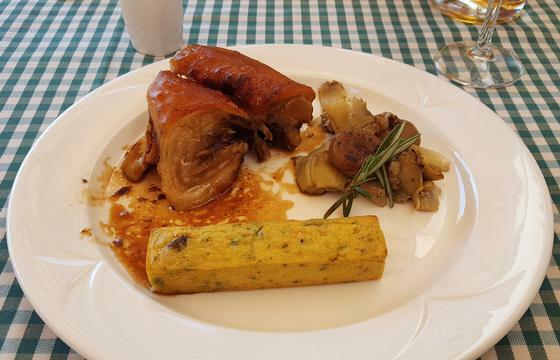 And the roast pork with pearl onions, artichoke and polenta (€21,50) might honestly have been the best thing I've ever eaten in a park. So, Ferrari Land brings mostly good stuff to the resort. But is it worth the extra admission? The crux of the matter for me is one of audience - and I'm not sure the price point is quite right for most. If you're just visiting for the day - and for the first time - there's plenty to do in the original park. €13 for a coaster and a few midway attractions might make sense as a top-up if you're a returning visitor though, or planning a couple days. We're staying at a resort hotel, where the top-up price for a single day ticket was €35. I'll leave that to your own judgement as to whether that's a price worth paying, but that seems steep to me for a single land, no matter how well-designed. Ferrari Land undoubtedly shows PortAventura at the peak of their design talents. I just hope that the operational strategy pays off for them (and provides the financial security to invest more in staffing levels - often a problem at the parks). It certainly has the potential to be the jumping off point for an impressive full second gate. April 8, 2017 at 3:40 AM · Looks nice but as an upcharge it will be empty just like the one in Abu Dhabi. Ferrari is not enough of an emotional brand to support an entire park or upcharge land. Would be a nice add to an exiting park, but not an upcharge. How was the screen quality of the Soaring-style ride? In AD, you can clearly see the white grid lines on the screen, which is horrendous. The music score is also quite underwhelming. April 8, 2017 at 4:11 AM · We were sat athere the very end of the row, so it was a little warped - but otherwise seemed good. I don't know if it's the same film as in AD, but I found the score quite fitting (albeit notably Soarin'-esque). April 8, 2017 at 9:59 AM · Ferrari is not enough an emotional brand? It has millions of fanatic tifosi spread all over the world. It is one of the most, if not THE most popular sport team in the world! Perhaps it is not popular enough among theme parks fans, hard to tell, but it has a huge emotional appeal. April 8, 2017 at 11:22 AM · While Ferrari is one of the world's most powerful brands, and certainly a premium brand in the automotive industry, I am far from convinced that Ferrari is yet a premium brand in the travel/theme park industry. Unlike luxury cars, this is a volume business, and Ferrari needs to either up the available attractions or cut/bundle the price if it wants to avoid its branded parks being empty ghost towns. April 8, 2017 at 4:55 PM · Certainly Ferrari is an emotional brand. I just don't think it's one that can create an affective, sensory space capable of attracting a critical mass of visitors necessary to sustain financially an entire park or upcharge land. Most emotional brands would probably fail at a theme park. I can't see a successful Louis Vuitton or Prada theme park. I can't see a successful Cheerios, Apple or Nike theme park. A rock music theme park sounded like a good idea (certainly music is filled with nostalgia and affect) until Hard Rock Park failed. An entire theme park based on a sports car... I don't think it can regularly fill with visitors to turn a profit, but I wish them luck. April 8, 2017 at 5:07 PM · The park looks like fun, and it is definitely somewhere I'd check out on a visit to PortAventura. However, I don't know that something like this will get very many repeat visitors, particularly as a separate gate. The park is tiny, so I'm guessing most visitors would probably be able to do everything in around two hours, and the attractions don't seem like ones most visitors are going to care about doing more than once. €13 is at the upper end of what I'd consider reasonable, but it's definitely high enough that those with no interest in Ferrari may hesitate. At least Red Force provides a draw for thrill seekers...without that this park would be a guaranteed failure. As for the lockers, Six Flags and Cedar Fair parks use that setup on some attractions, where anything that can't fit in your pockets must be stored while you ride. At those parks, $1 is typically good for two hours of use (assuming you don't open it), so it is often possible to get 2-3 rides out of a single rental. April 9, 2017 at 1:37 AM · So, did I understand the article correctly - is it €13 extra for those staying offsite but €35 extra for those staying onsite at a resort hotel? Why the large difference in price? I'd be happy to pay another €13 for a few hours here but €35 might be pushing it. I think they made a mistake making this a separate gated park. If it was another land in Portaventura park then it would have been very welcome. But there just doesn't seem to be enough attractions for Ferrari Land to stand on its own. April 9, 2017 at 8:12 AM · The Ferrari brand thing is tricky. It has no pull for me whatsoever, while my friend - who loves Formula 1 - didn't find it did anything interesting with the brand for him. As a result, the specific Ferrari elements ended up just feeling like an advert or branded experience, which isn't terribly satisfying. It was far more effective when using it as an excuse to indulge in Italiana - by far the most successful aspect of the land. I haven't been in since that first day (even if you're in the hotel, the up-charge only gets you a single day access) but I'm seeing quite a few complaints of long queues. I'm sure part of this is down to staff getting used to operating the rides, so that'll improve as time goes on. But I did notice some of understaffing issues that the first park suffers from. Hopefully that'll be spotted and resolved in response to feedback. As for lockers - even things in pockets were prohibited. I hope that's just over-eager staff on a first day, but we'll see.